Last week I wrote about some unique uses for modified shipping containers in Austin Texas. After a very unscientific survey of customers over the years I thought I'd list some of the most common applications for repurposing shipping containers. The most common application of a shipping container is for use as additional storage space. This is both a residential and commercial application that anyone who needs a little extra room can use. Shipping containers are weather tight and secure so they are ideal for storing household goods as well as excess inventory. Shipping containers are also commonly used to store tools and materials on construction sites. 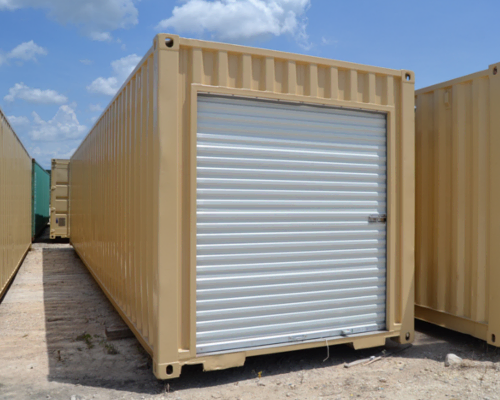 Renting or buying a shipping container to securely store tools and stage materials is a very practical way to make sure a construction job runs smoothly. Churches of all faiths and denonminations use shipping containers to organize and store donated goods or seasonal decorations. Farmers use shipping containers to store feed and hay. It's important that hay stays dry so it doesn't get moldy and a shipping container is a perfect way to free up space in the barn and keep hay dry. Finally, shipping containers also make document storage vaults. In some businesses paperwork storage is a real headache so many people have turned to shipping containers to help relieve the avalanche of paper that's built up in their office. These are just a few uses for shipping containers that I've seen around town here in Austin Texas. If there's something I forgot and you'd like to share it with me contact us at 877-704-0177.